It's my favourite time of the year and I am already so excited! But I know that sometimes when you're busy at work or uni, it's hard to get into the festive spirit. 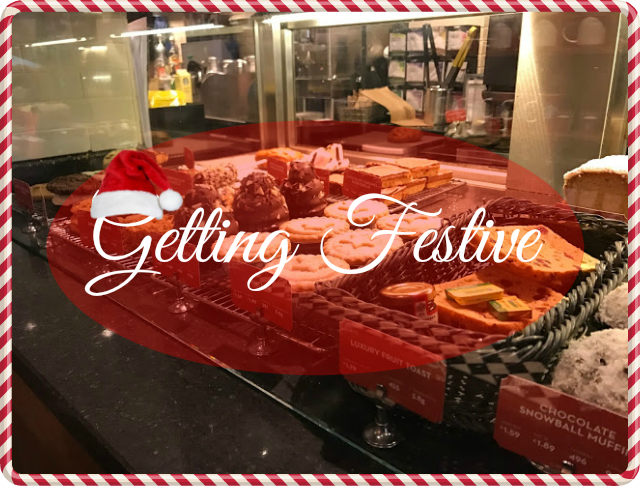 So to start off #blogmas I thought I'd share a few of the things that I really look forward to doing at this time of the year! Going into Costa and Starbucks at this time of the year always makes me feel really festive. They always have such a wide array of drinks to choose from! Starbucks has the traditional Eggnog Latte and Gingerbread Latte which are my two personal favourites. I'm even going to show you how I make them myself at home later this month! Costa also has some really good choices, this year they've introduced the Lindt Hot Chocolate that I am yet to try, but boy does it sound amazing?! What is your favourite festive drink? Let's be honest, I've been doing this since October! But having Christmas songs playing in the background while I'm getting ready for work or cooking up a meal just instantly puts me in a good mood. Last week I went to the Christmas Ideal Home Exhibition in Olympia and people, including myself, were singing to the Christmas music in the background while walking around and browsing the stalls - and people were smiling, can you believe! My favourite album has to be Micheal Buble Christmas album! I say this with a pinch of salt, because there is nothing I hate more than going shopping when there is a million of people outside. I'm more of an online-shopper - because I get to stay in my pj's all day. But I do always try to head down to Oxford Street one of the days because the shops always have beautiful displays. The display outside John Lewis was so lovely this year and Debenhams went all out with their gift displays too! Every December I go crazy with buying party food packs from the supermarket. I don't know what it is about mini pizzas, prawn toast and chicken satay that I love so much but I somehow always manage to pack the fridge full of the stuff! I couldn't sit here telling you which supermarket has the best party food because I love them all! I love receiving presents, but as cliche as it sounds, I love getting gifts for others too! Particularly the people that are close to me as I know what they have been after all year or know what their passion is! So buying something that I know they'll appreciate and love is my favourite thing to do! If you follow me on Twitter (@neelamjayna) you'll know that I have made an advent calendar of presents for my boyfriend, which I'll be posting every 5 days of the month, and it was so much fun to create. I know the things he likes and the things that he might need which made it super easy to do! This is the time of year where eating healthy just goes out the window. I can't juggle Christmas cheer and a healthy diet. I've tried and I've failed. But hey, it's just one month of the year! I love to make mince pies and chocolate yule logs which always go down a treat! This year I'm having a second attempt at making a Gingerbread House - and of course, I'll blog about it! I can't wait to get back at it! What are your favourite things to do at this time of the year?